When I was in Brazil I went on different trips and tours and one of the most spectacular ones for me was the guided tour to the Iguazu Falls which included a look of the falls from both sides, the platform in Brazil and in Argentina. My Foz do Iguaçu excursion started at Iguazu Airport where my holiday in Brazil began. From the airport I was picked up by my travel guide and after a good night's rest it was time to explore Iguazu! The Iguazu Falls are a very spectacular tour destination and from where you can watch out over the highest point of the Iguazu Falls to the boardwalk all the way at the bottom, I couldn't stop gazing around, what an impressive views! 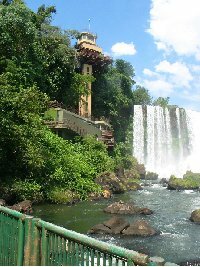 The guided tour of the falls was split in two halfs and starting in Brazil my falls adventure ended at the viewpoint on Argentinian territory, also known as the Garganta del Diablo, or Devil's Mouth. The nice thing about this scary sounding place is the train ride to get there, amazing! 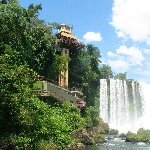 Did you enjoy Iguazu Falls guided tour and have you been on a holiday in Iguazu River, Brazil?